Once seen, properly seen, it is impossible to forget – from each aspect utterly different, yet always itself: the long rock-ridged summit of Rough Tor. It is Cornwall’s sacred mountain – its Fuji, its Ararat. In terms of world-ranking peaks it is no more than a pimple, just 400-metres high. It is not even Cornwall’s top spot – that numerical accolade belongs to its less-dramatic neighbour, Brown Willy (from Cornish bron wennyly, “hill of swallows”). But spend any time on Bodmin Moor, from whose northern wastes Rough Tor rises like a mythical island, and you will grow aware of its haunting presence. When it is hidden, you will find yourself looking around, trying to locate it. Then, as you climb out of some bog and see the distant granite-stacks of the summit peep over a grassy ridge, an imperceptible relief will quicken your pace – as if for one fleeting footstep what was wrong with the world has been corrected. It is deeply satisfying to discover that those archaeologists who know the moor well, and have studied its wealth of late-neolithic and early bronze-age monuments are now suggesting that such cathartic moments might help explain their original building. Stone circles, stone rows, hundreds and hundreds of propped-stones scattered across the moor reveal a remarkable pattern – the greater part of them by far are aligned visually to Rough Tor. Many are positioned precisely where the peak first comes into view; even 10, 20 miles away, barrows or tumuli stand just where Rough Tor appears. Standing on top of Rough Tor itself, amid its sculpted boulders, with the entire peninsula spread out at your feet, is an impressive enough experience. But looking it from afar is something more profound, more enduring. You begin to spot it in the landscape, like a much-respected friend across a crowded room. It is a reminder that what we feel striding around such “ritual landscapes” is what people felt thousands of years ago, the same awe at natural features that prompted them to arrange into circles and rows and burial chambers very large lumps of rock, creating Europe’s earliest stone architecture. To see living things I go to the place of the dead: the churchyard of St Michael’s in Dulas. Or, if you will, God’s Acre in God’s Own County. I went yesterday. Everything about the churchyard is perfect, beginning with the setting in a verdant valley far from the madding crowd. Two overgrown redwoods form a living lychgate, their resin a natural incense. Obligingly, walking up the path before me was a particularly pious pheasant in full episcopal rig, though if he wished to officiate at holy communion he was a decade too late. The church itself is decommissioned; only communion with nature takes place at St Michael’s. 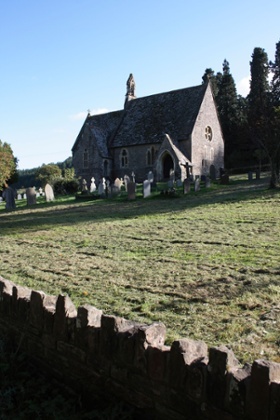 When the church was built in 1865 the makers simply enclosed a bit of local field for burial. Within the dry stone wall boundaries of St Michael’s is preserved a relic of ancient, glorious, traditional English hay meadow. It is like looking back in time, to the age before agricultural “improvement”. The wild daffodils are now over, but the bluebells are coming out to join the primroses, the cowslips, the violets. Later, there will be greater butterfly orchids, betony, black knapweed, tormentil, yellow rattle, vetchling, burnet saxifrage, and twayblades, and quaking grass – and all beasts and bugs who love and live on them. I have seen slow worms there, six spotted burnet moths too. Across the lane is Dulas Court, which was once a retirement home for musicians, some of whom are buried in the churchyard. There could be no more fitting place, because birdsong pours into the churchyard of St Michael’s. A blackcap trilled vespers for me last night as I left. There is a kind of salvationist hope in a churchyard; a belief that God’s Acre will somehow escape the destruction of nature that comes courtesy of chemically-addicted agri-capitalism, politicians’ vanity projects in railroad-building, and Persimmon’s wet-mortar dreams. But, really, God only knows. I’m writing this in a farmhouse on the edge of the moors above Haworth, West Yorkshire. In the woodshed a pellet boiler’s being installed – there’s some concern that its droning will put off the swallows that normally nest there (we spotted the year’s first this afternoon). The lambs are blahing and gargling pitilessly from the adjacent field. “Give over,” I just told them. They arrive late up here, and are still rickety as botched stools. This morning we took a walk I know pretty well, and which I love as much as any: up the taxing hill behind the house, past the gamekeeper’s cottage and onto the moor. The heather-burning season is over, but in patches the ground is still cindered with its aftermath. Walk east a few miles and the crowns of two trees appear over the moor’s brow, the westernmost specimen beginning to bud. As you walk on, the roofless house they attend comes into view. These ruins are known to hundreds of thousands, despite their isolation. 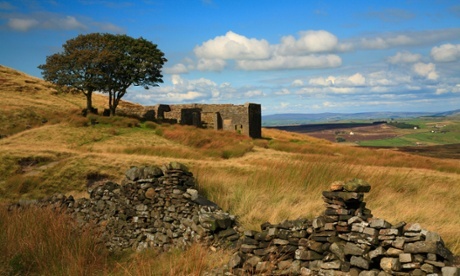 For they are what is left of Top Withens, the house associated with Wuthering Heights. Those twin trees beside them have always moved me: stalwart sycamores, holding out against the Ural winds – since Emily Brontë’s day, I like to think, though they are not that old. A caravan of tourists braves the hike uphill from the Brontë parsonage three miles away. If it’s “peace” you think you want, follow the Pennine Way south for a mile or so. Abandon the flagstones and soon you’re in a desert realm. All around is flat and silent bog tinged blood-red by the stalks of cotton grass. And then the wind dies, and stillness occurs, like the slowing of a wheel. At my feet, three hours later, the woodburner is ticking, and its radiance smarts where I’ve caught the sun. This article was written by The Guardian from The Guardian and was legally licensed through the NewsCred publisher network.